Flowering dogwood (Cornus florida): growing, planting, caring. Cornus florida - the flowering dogwood - is a species of flowering plant in the family Cornaceae native to eastern North America and commonly planted as an ornamental in residential and public areas because of its showy bracts and interesting bark structure. It s a small deciduous tree growing to 10 m (33 ft) high, with opposite, simple, ovate, 6–13 cm (2.4–5.1 in) long leaves, with a finely toothed margin, turning a rich red-brown in fall, and small flowers with four greenish-yellow bracts produced in a dense umbel-shaped inflorescence, surrounded by four large white, pink or red bracts - or « petals ». The flowering dogwood is sometimes treated in a separate genus as Benthamidia florida (L.) Spach, and two subspecies are generally recognised: Cornus florida subsp. florida – from eastern and south-central United States, and Cornus florida subsp. urbiniana – from northeastern Mexico. Some selected cultivars of this tree also have pink bracts - like ‘Amerika Touch-O-Pink’, with large bracts, tinged pink - some even almost a true red - like 'Cherokee Chief’. Other cultivars inculde 'Cherokee Princess' – with vigorous white bracts, a standard for white flowers - or 'Hohman's Gold' – with white bracts and variegated foliage. 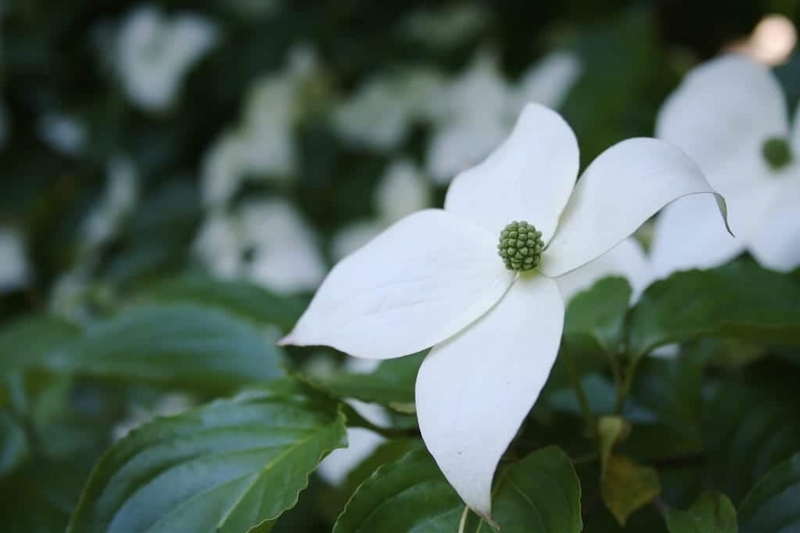 Flowering dogwoods are: Florida dogwood, Cornus florida, Japanese dogwood, Cornus kousa, Pacific dogwood, Cornus nutalli and their cultivars, including the Chinese dogwood, Cornus kousa 'Sinensis'. Their common points: their flowers are small, surrounded by large white or pink bracts appearing in May. The leaves are opposite, oval, deciduous. Plant from late autumn to early spring, in non-burning sun, in moist, slightly acidic, cool, well-drained soil. Do not bury the base of the plant, tamp the soil around the roots, form a hollow and water until the water no longer flows visibly. Water thoroughly once a week in the first month. In the first year, keep an eye out and bring water when needed, especially in limestone soil. Give your dogwood flush fertilizer before winter, with a good mulch that will maintain the level of acidity of your soil, and provide the nutrients that these shrubs need. Ideally, bring compost to the top of the soil, and let it finish its decomposition at the base of the plant, under the mulch. If you notice brown round spots on the leaves of your Cornus florida, it may be an anthracnose attack. These attacks are favored by other physiological problems of the plant: unsuitable soil, too violent sun, too severe pruning, etc. Only trim dead or damaged branches, as these shrubs have a remarkable natural habit.